Be sure to see more creativity via Metamorphosis Monday posts over at Susan's Between Naps on the Porch... and BLUE posts via Smiling Sal's! Anddddd don't forget to learn more about moi over at Small Town Living and enter my GIVEAWAY... deadline to enter is Wednesday!!! Winner will be announced on Friday... Good Luck! I will be posting Tuesday through Friday... tomorrow a little Oscar fashion maybe... Wednesday outdoor ironwork in Paris... Thursday another restaurant in Paris... Friday... something fashionable!!! Fifi Flowers' Bargain Painting Gallery is STOCKED with paintings for YOU and a few paintings available in My Etsy Shop at reasonable pricing too!!! I just love the pink flowers with the blue bike! So pretty! Oh, so pretty and perfect for Spring! Adorable Fifi, I think I have mentioned it before...I want a new bike for springtime!! That blue bike just sets the flowers off. A really different and nice post for today. i love that bike, i used to have a yellow one that was awfully similar! ooooooh fifi....this my favourite!!!! clever chicky babe !!! Love the painting! One of my favorite things living here is seeing people riding bikes and flowers in their baskets.Have a wonderful week. Fifi, Love the paintings for today, the blue bike is one of my favorites. I used to have a bike almost like that one. bwaaaa, I want it back!! Your touches of color make the street in Paris even more charming. Happy Blue Monday. Beautiful, Fifi! The bicycle reminds me of the first one that I ever had...I was 7 years old and my grandfather bought it for my birthday present...it was a 2 wheeler and had my name inscribed..very special. Beautiful! It's like spring might actually arrive! My mom owned a bike just like that one years ago! What a beautiful post! I watched an Audrey Hepburn movie last night ~ "Paris When it Sizzles"~ so your post just added to this Alabama girl's ooh la la mood today. Have a Happy Day! I've always loved Koralee's bike and it is such fun to see it in your painting. Wonderful post! How can that not cheer us up. wow this is very pretty you are such a creative and talented one. happy blue Monday. Love the blue bike added to the painting. Love that blue bike. Clever idea. The blue bike is really nice. I use my childhood bike in my garden for plants. Very nice pic too. I LOVE THAT, so pretty and fun! Pink and blue; how fresh and utterly pretty. 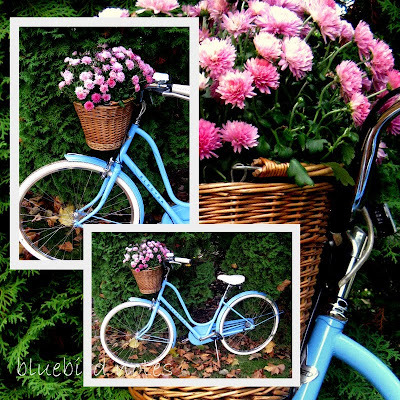 A blue bike with flowers just makes me smile and think of Spring; thanks for sharing! From on fellow artist to another; I love your art and find very much so, that your beautiful blog reflects that artistry! 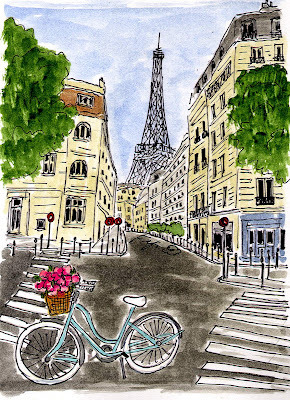 This is one of my favorite painting yet, it really captures Paris! 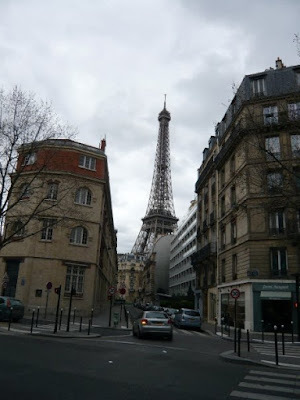 You wow me again with such Parisian beauty! All your photos are gorgeous though I like most the blue bike filled with lovely ruby flowers. I love Marie! She's such a vibrant teal (is it?) I love that shade of blue :) And as always, fantastic painting. You are gifted! Happy Pink Saturday Fifi! Thanks for stopping by and for your comments. I love the bike, the colors are fantastic. Gorgeous work,as usual! Love Koralees bike with the pink flowers, also your lovely painting.